The St. Thomas Tommies have announced that another forward will be joining the team for the 2012-13 season. 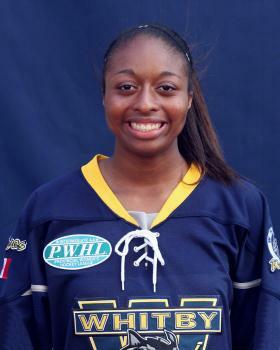 Kenya Marcelline from Whitby, Ontario will be another big addition to the forwards for STU and will join previously recruited Kelty Apperson, Emily Francis, and Emily Ryan up front. The Tommies, who finished sixth out of seven teams in the AUS last season for goals scored with 59, can certainly use the extra POP in the lineup. Marcelline was seventh in team scoring this past season for the Whitby Wolves of the PWHL, scoring 10 goals and 18 assists in 34 games. You can view her stats HERE. Welcome to St. Thomas Kenya!